Yes, it's that time of year again. Wednesday, May 24th is Tommy's birthday. Sixty-two years ago the king of dope was born in Edmonton, Alberta, Canada. Long live Tommy Chong! Tommy Chong's been on the road doing his standup. He just announced a slew of new dates for 2000. Be sure not to miss this once-in-a-lifetime chance to meet Chong, see his show, and maybe score an autograph. Cheech Marin will be the host of Funny Flubs & Screw-ups tonight at 8PM on CBS. In brief, it's a blooper-esque program which is part of CBS' Cinco De Mayo night. Today on the Rosie O'Donnell Show, Rosie spoke about the celebrity edition of Who Wants to Be a Millionaire which aired last night. This led to a discussion about the time she was a contestant on celebrity Jeopardy. Rosie said Cheech Marin did the best that night and that he knew the most obscure facts. She also said that she was taught in school that "hallucinogenics" messed up your brain. "But he got the highest of anyone," she said. She sounded jealous. She made a snotty comment about not knowing which is Cheech and which is Chong. At a party earlier tonight, Don Johnson, Cheech Marin, George Lucas and many others celebrated the 100th episode of the CBS series, Nash Bridges. It was held at the vietnamese restaurant that Johnson owns. In case you missed it, Richard "Cheech" Marin was on the Food Network's "Bill Boggs Corner Table" not too long ago. The Cheech segment took place at Cheech's favorite restaurant, Aqua. We here at Cheech and Chong Dot Com have been to the Aqua in NYC and this restaurant is EXPENSIVE. There are no menus. If you have to ask what the price is, you shouldn't be there. Richard and Bill joked around for a while. At one point, Bill asks Cheech what was in that huge joint (referring to Up in Smoke). Cheech replies, "Stunt Weed." The two enjoyed a four-course meal which included a chocolate shake made using Aqua's own root beer which is brewed on site. Click on the thumbnail above to see the entire photo. Bill Boggs Corner Table was kind enough to send us this photo. Catch Co-star of CBS Nash Bridges, Cheech Marin, at Aqua (San Francisco), SUNDAY MARCH 12TH, 9pm eastern on Bill Boggs Corner Table on Food Network! Bill sits down with four stand-ups in a comedic power hour. Also dining with Bill are The Hughleys' D.L Hughley (catered on the set of his show by Richard Kraupp and Asia De Cuba), King of Queens' Jerry Stiller at Ernie's (NY), and Howie Mandel at the NBC commissary (LA). Bill: "What was really inside of those joints the size of a hoagie roll?Cheech: "Stunt dope." • Corsican Brothers VHS - out-of-print uncensored version of video. • Big Bambu LP - with huge rolling paper. • Sleeping Beauty 45 - Special 45 single from this highly requested album. Click here to see what's up for auction. ** Not an ebay member? Click here to sign up. It's free. • It Came From Hollywood VHS - Cheech and Chong, Dan Aykroyd, Gilda Radner and John Candy goof on classic sci-fi movies. It can still be purchased new, but it's more affordable to bid on this previously viewed video. • Sleeping Beauty LP - Need we say more? We receive 200+ emails every week looking for this out of print album. This is the last one we have. Legendary actor, Stacey Keach, best known for his role as Sgt. Stadanko in Nice Dreams and Up in Smoke, as well as for his television series, Mike Hammer, has a sitcom on the way. Titus will premiere on the Fox Network Monday, March 20th at 8:30 PM/7:30 C following That '70s Show. After sitting in front of the square box with moving images for one hour, the staff at Cheech and Chong Dot Com concluded that E! did a fantastic job detailing the life and times of the legendary duo. In case you missed it, E! premiered their Cheech and Chong "True Hollywood Story" episode last night (note: re-broadcast yet to be scheduled). As expected, Tommy and Richard downplayed the amount of hostility that existed between the two of them. However, they did reveal that the problems began after Tommy was credited as Director of Next Movie, even though Cheech felt he had contributed equally. The tensions peaked during the filming of Get Out of My Room, for Cheech longed to pursue a serious acting career (which he accomplished). After making their last on-screen appearance together in After Hours, the duo went their separate ways. On a happier note, Tommy and Richard did not rule out the possibility of a reunion. They gave the impression that, if the money and script are right and the duo are both at the same point in their lives, they'd be willing to do a movie. We hope they do reunite! We want a simple movie with classic, crude drug humor. Oh, and one more thing...Stacey Keach must return as Sgt. Stadanko! To celebrate E! Entertainment Television's premiere of its Cheech and Chong special we are launching our largest auction to date. • Los Cochinos car-shaped LP - Cover is shaped like a car. Sleeve reveals that C&C are smuggling drugs. • Yellowbeard Media Kit - Tons of photos and info about the all-star cast. Highly collectible. • Bloat On 45 - From the Ltd Release single from the Let's Make a Dope Deal LP. Few have seen, nor heard this song. • Big Bambu LP - with huge rolling paper. The last one we have. On Sunday, March 12th @ 9pm, Richard Marin will be a guest on Food Network's "Corner Table with Bill Boggs." More details will be posted as they come in. Tommy a "Regular" on That 70's Show? It would seem to me, the Weedmaster, that Tommy Chong is becoming a "regular" on Fox's That 70's Show. He appeared again tonight as the local camera store owner. This makes it his third appearance if my count is correct. This time it's for real. E! 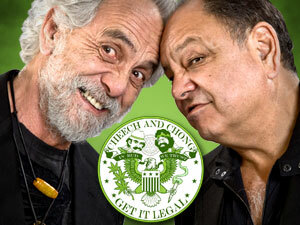 has officially released the air date for their documentary on Cheech & Chong. It premieres THIS SUNDAY, FEBRUARY 20TH @ 9pm est. (even though the E! web site reports a different time). Double-check TV Guide for the correct airtime in your area. The documentary is actually part of E! 's True Hollywood Story series, not Mysteries and Scandals, as previously reported. We're told the two hour special will detail the rise-and-fall of Cheech and Chong, as well as the reasons why Cheech left the duo. Don't miss it! Congratulations are in order for S.M. of Florida and W.L. of Ohio. They're the winners of our newsletter contest. Each will be receiving a Cheech and Chong's out-of-print Sleeping Beauty LP.